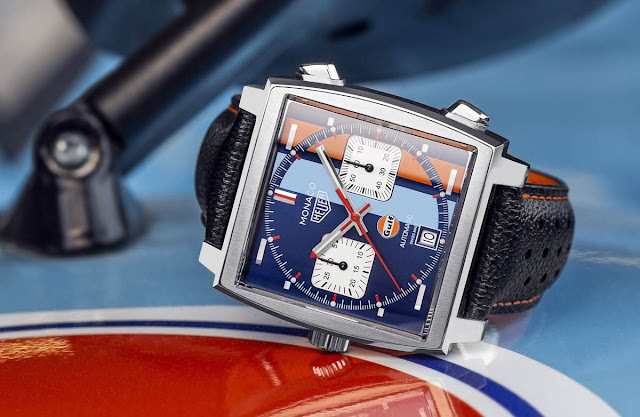 TAG Heuer introduced the Monaco Gulf Special Edition 50th Anniversary, a limited edition of just 50 pieces commemorating the 50th anniversary of Gulf's first victory on the 24 Hours of Le Mans. 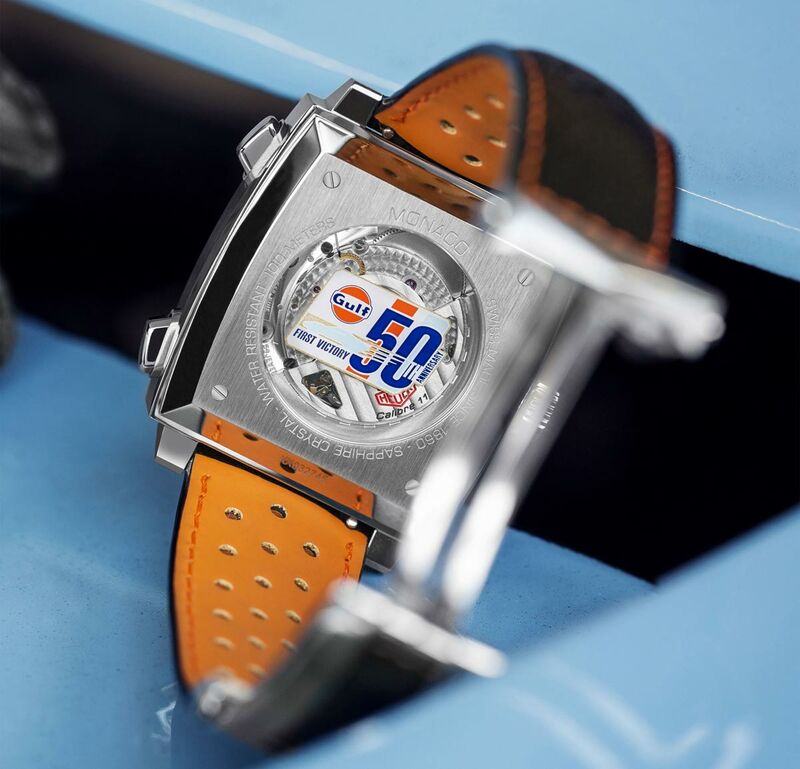 Like the original, the Monaco Gulf Special Edition 50th Anniversary features the crown on the left and angled chronograph buttons on the right side. The signature square case (39 mm x 39 mm) is made in stainless steel and it is water resistant to 100 meters. 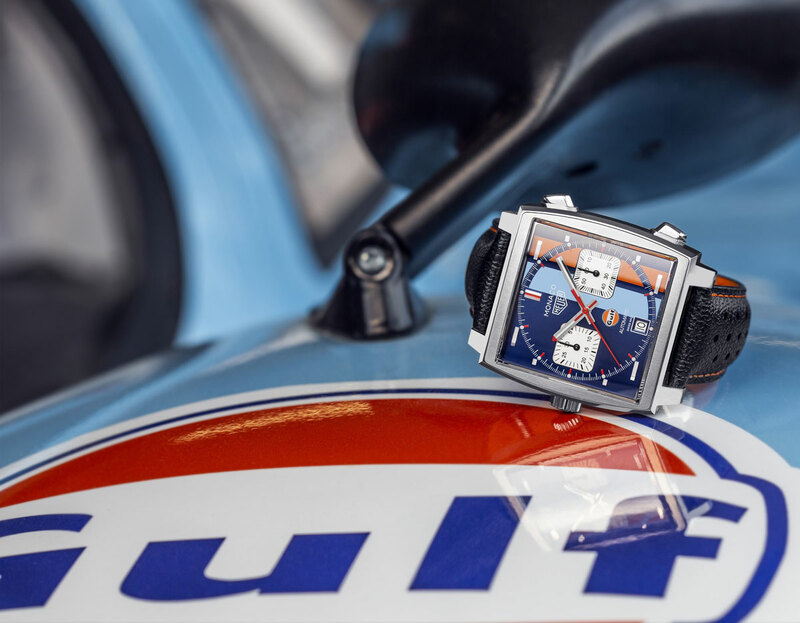 Protected by a beveled domed AR-coated sapphire crystal, the blue sunray brushed dial is characterised by blue and orange Gulf stripes, date window at 6 o'clock, diamond-polished horizontal hour indices and the inscribed vintage Heuer logo. A small Gulf logo is visible just above the date window. 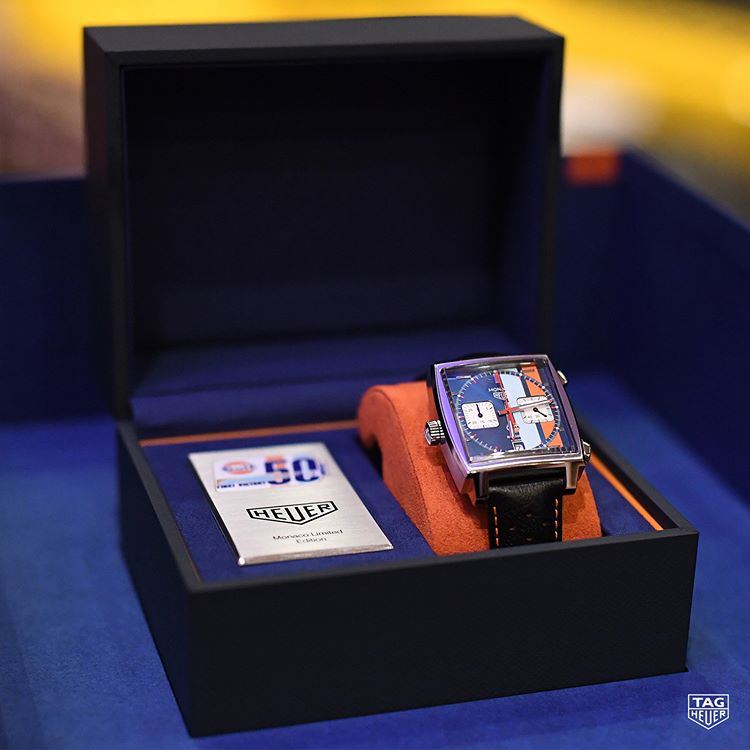 A detail that characterises this special edition, the Gulf logo is displayed also on the sapphire crystal caseback. The movement is the Swiss automatic TAG Heuer Calibre 11 with 59 jewels, 28,800 vibrations per hour and a power reserve of 40 hours. 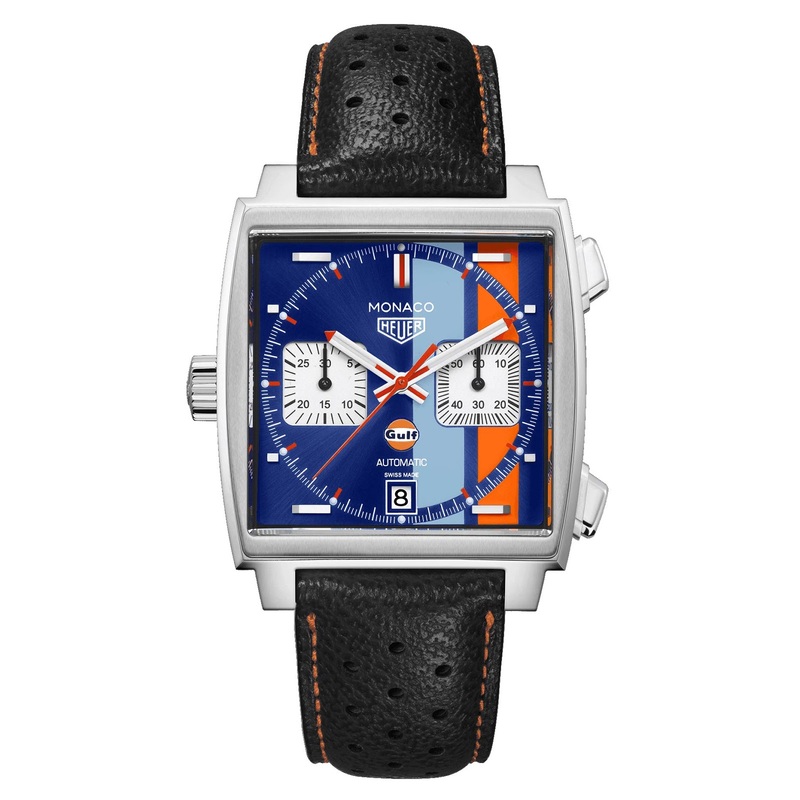 TAG Heuer Monaco Gulf Special Edition 50th Anniversary. TAG Heuer introduced the Monaco Gulf Special Edition 50th Anniversary, a limited edition of just 50 pieces commemorating the 50th anniversary of Gulf's first victory on the 24 Hours of Le Mans. 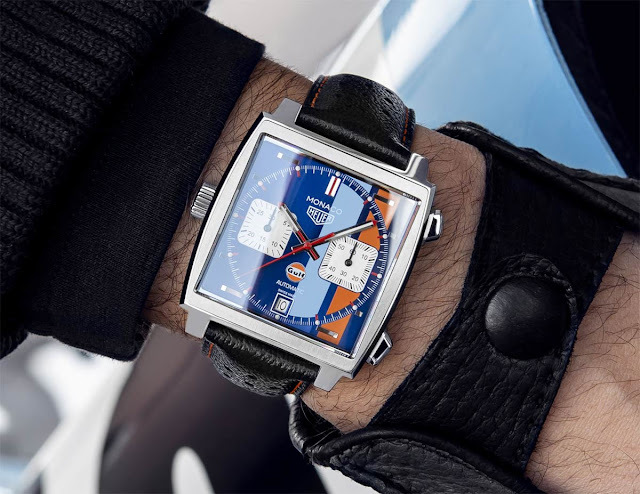 The TAG Heuer Monaco Calibre 11 Gulf Special Edition 50th Anniversary (ref. CAW211T.FC6440) has a price of Swiss Francs 6,200.